The Homework Helpers Series is just what high school students need to boost their confidence and give them everything they need to ace even the most challenging classes. Do you fear mole conversions and Avogadro's number? Are oxidation-reduction reactions just too much to handle? Are the Ideal Gas Laws getting you down? 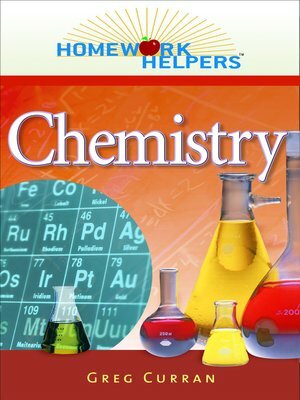 Homework Helpers: Chemistry is a user-friendly review book that will make every student or parents trying to help their child feel like he or she has a private Chemistry tutor. Concepts are explained in clear, easy-to-understand language, and problems are worked out with step-by-step methods that are easy to follow. Each lesson comes with numerous review questions and answer sheets that explain each correct answer and why it's correct. The mole concept and stoichiometry, including limiting reactant problems. Gas laws, chemical kinetics, acids and bases, electrochemistry, and more. While Homework Helpers: Chemistry is an excellent review for any standardized Chemistry test, including the SAT-II, its real value is in providing support and guidance during the year's entire course of study.